VIEW AT YOUR LEISURE IN OUR HEATED SHOWROOM..... YOU WILL NOT FIND A NICER OR BETTER CARED FOR EXAMPLE IN THE BEST COLOUR COMBINATION OF METALLIC DARK BLUE (NEARLY BLACK) & FULL UNMARKED BLACK LEATHER UPHOLSTER INCLUDING DOOR TRIM WITH LEATHER 'M SPORT' STEERING WHEEL & GEAR KNOB WITH COMPLEMENTING BRUSHED ALUMINIUM DASHBOARD, CENTRE CONSOLE & DOOR TRIM..... FITTED WITH NEW UPDATED CARBON FIBRE LOOK BONNET BADGE, BOOT BADGE & ALLOY WHEEL CENTRES WITH COLOUR CODED/DE-CHROMED FRONT GRILL & BMW LOGO PUDDLE LIGHTS. WE HAVE JUST HAD THE CAM CHAIN WITH TENSIONERS REPLACED WITH NEW MOT & SERVICE..... 10 SERVICE STAMPS & ONLY 2 FORMER KEEPERS..... HUGE SPECIFICATION INCLUDING: CLIMATE CONTROLLED AIR CONDITIONING, CD PLAYER WITH AUX INPUT WITH HANDSFREE PHONE CONNECTION, CRUISE CONTROL, PARKING SENSORS..... SUPPLIED WITH 12 MONTHS PARTS & LABOUR WARRANTY WITH NATIONWIDE COVER & 12 MONTHS AA BREAKDOWN COVER..... 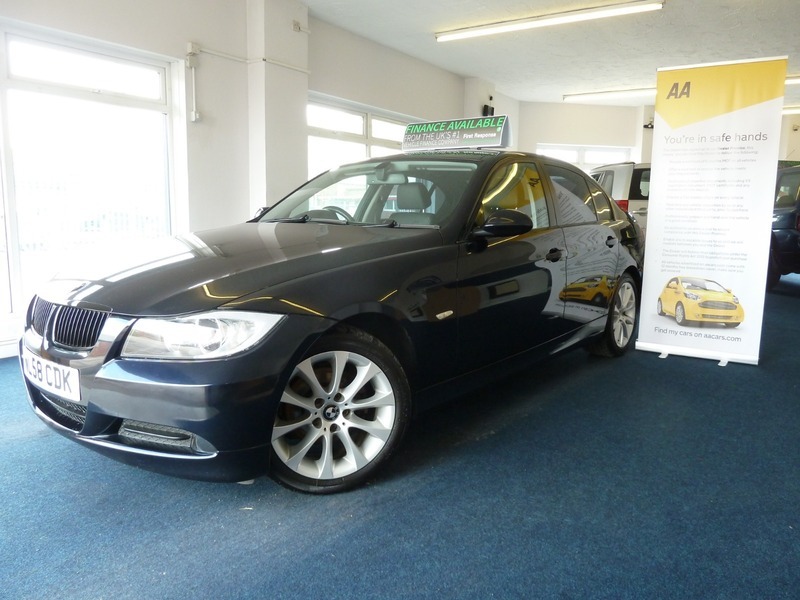 STUNNING 58 REG BMW 318 (2.0) SE EDITION 6 SPEED. ONLY 115,000 WARRANTED MILES (AVERAGE 10,500 MILES PER YEAR). NEW MOT UNTIL 28TH MARCH 2020 (WITH NO ADVISORIES) INCLUDING SERVICE. ALLOY WHEELS FITTED WITH EXCELLENT MATCHING BRIDGESTONE POTENZA TYRES ON REAR WITH 5MM TREAD & MATCHING HANKOOK VENTUS S1 EVO TYRES ON FRONT WITH 7MM TREAD. SUPPLIED WITH 2 REMOTE KEYS, COMPLETE ORIGINAL OWNERS BOOK PACK & BMW LOGO CARPET MATS. FANTASTIC LUXURY, ECONOMICAL & ULTRA RELIABLE BMW MOTORING OFFERING AVERAGE 48 MILES PER GALLON & ONLY £160.00 PER YEAR ROAD TAX OR £14.00 PER MONTH ON DIRECT DEBIT. HUGE SPECIFICATION INCLUDING: DUAL ZONE CLIMATE CONTROLLED AIR CONDITIONING, CRUISE CONTROL, TRACTION CONTROL, BMW PROFESSIONAL CD PLAYER WITH AUX/IPHONE INPUT WITH HANDS-FREE PHONE SYSTEM, FRONT & REAR ELECTRIC WINDOWS, ELECTRIC MIRRORS, AUTO-DIM REAR VIEW MIRROR, HEIGHT ADJUSTABLE DRIVERS & PASSENGER SEATS, TWIN DRINKS HOLDER, STEERING WHEEL MOUNTED STEREO & PHONE CONTROLS, TWIN ILLUMINATED VANITY MIRRORS, HEIGHT & REACH ADJUSTABLE STEERING WHEEL, ON-BOARD COMPUTER, PUSH BUTTON START/STOP, FRONT ARMREST WITH STORAGE & 12V SUPPLY, MULTIPLE AIRBAGS INCLUDING SIDE IMPACT AIRBAGS WITH OPTION TO TURN PASSENGER SEAT AIRBAG OFF FOR CHILD SEAT, PASSENGER SEAT HAS ISOFIX FITTING, INDIVIDUAL REAR HEATER CONTROLS, REAR HEADRESTS, REAR ARMREST WITH DRINKS HOLDER, 3 X 3 POINT REAR SEAT BELTS, ISOFIX, REAR READING LIGHTS, 12V SUPPLY IN BOOT, UNDERFLOOR STORAGE IN BOOT, REAR PRIVACY GLASS, FRONT FOG LIGHTS, PARKING SENSORS, FULLY COLOUR CODED, REMOTE LOCKING & ALARM. Please Note: For Further Information Please Contact Us On 01384 429630 Or 07825 137260. Finance Available With Upto 5 Years To Pay. The Vehicle Is Supplied With A 12 Months Parts & Labour Warranty With Nationwide Coverage & Unlimited Mileage, Extendable If Required. Free 12 Months AA Breakdown Cover. Any Trial Or Inspection Welcome. Viewing By Appointment. Please Call For More Details. Open 7 Days Til Late. Part Exchange Welcome, Please Contact To Agree Value. All Vehicles Are HPI Checked. All Major Credit & Debit Cards. We Are Located 5 Minutes From The Merry Hill Shopping Centre At Cradley Heath, West Midlands, B64 7AA. 10 Minutes From Junction 2,3 & 4 Of The M5. We Can Tax Your Car Ready For Collection If Required. Please Check Our Customer Reviews And Buy With Confidence, We Have Been Selling Cars For Over 20 Years & Customer Satisfaction Is Paramount. We Can Arrange Pick Up From Cradley Heath Train Station Which Is A 20 Minute Journey From Moor Street Station, Birmingham. Delivery Can Be Arranged, Please Enquire For Price.